Set in Hong Kong, Knock Off is the tale of how the fashion industry intersects with the Russian mafia and the CIA. As if you didn’t already know. Tommy Hendricks (Schneider) is a fashion designer and his pal Marcus Ray (Van Damme) is shocked when he discovers “knock off” goods on the streets of Hong Kong, such as “Pumma” sneakers. But it’s all just a ruse to smuggle high-tech weaponry such as extremely dangerous and destructive bombs that explode with green flames. When the marketing manager for V-Six jeans, Karen Lee (Rochon), gets involved - as anyone might if they were somehow embroiled in a scenario that involved Exploding Counterfeit Jeans (or ECJ’s, as we like to call them) - they meet the mysterious Harry Johanson (Sorvino) and the stage is set for a lot of high-octane fights, stunts, chases and battles. Will these knock off products finally get our heroes...knocked off? Find out today! The purpose of movies, especially movies like this, is to entertain. And Knock Off certainly does. It seems to work overtime to please the viewer with all sorts of fast-paced and off-kilter scenarios, and the vibe becomes infectious. Just as director Tsui Hark did the previous year with JCVD in Double Team (1997), he teams him up with a wacky American sidekick. With Double Team, unforgettably, it was the one and only Dennis Rodman. Here, it’s with unlikely action star Rob Schneider. We even get some brief Schneider-Fu, and, unfortunately, he also appears shirtless. Both Rodman and Schneider were hot in the 90’s - which is easy to forget these days - which just adds even more to the nutty feel of these movies. If it’s one thing Knock Off has, it’s style, and we’re not just talking about fashion. Hark’s direction is filled with energy and overflowing with unusual camera angles (such as “shoe vision”) to the point where it can be described as cartoonish. Far from a bad thing, the whole venture seems very “Hong Kong” and he probably figured, after Double Team, ‘to hell with the American market, I’m doing this my way.’ What reinforces that are the fun, Jackie Chan-style stunts and fights. Sammo Hung is credited as Second Unit Director, and this may seem insane, but you can actually tell. It’s his action style all the way. 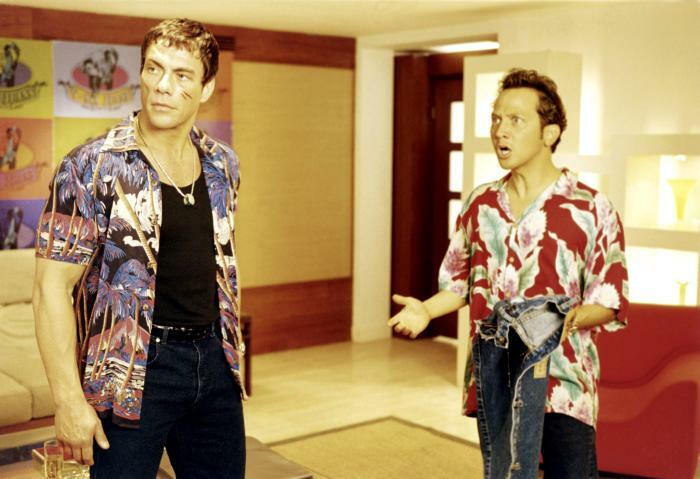 JCVD gets a great intro to his character in the film, and both he and Rob Schneider both wear zany Hawaiian shirts for most of the movie’s running time. Clearly they are the height of fashion. JCVD also has his typical funny faces on display, adding to the charm of the movie. While it was nice to see Paul Sorvino on board, though he seemed a tad bit confused (though wouldn’t you be?) 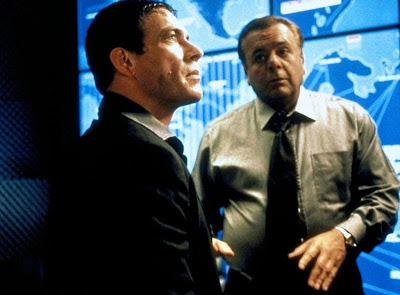 - especially in the scenes where he, Rochon, Schneider and Van Damme are all together (talk about powerful casting) - truly the biggest coup were getting the Mael brothers of Sparks fame to do the music. Their closing credits title song is very slick, clever and catchy, like most of their other work. You’ll be singing “It’s a knock off...” for weeks. Yes, weeks. Varouje Hagopian did additional music, and we’ve seen that name before (he seems to do the music for a lot of Billy Blanks movies). 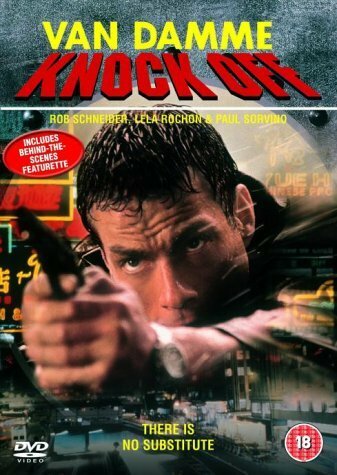 In the end, if it’s zany, colorful, well-choreographed action you seek, Knock Off is a great choice. Also check out write-ups by: DTVC and The Video Vacuum! I'm really enjoying the Van Damme run you're on. I honestly feel of all of the DTV actors, he always seems to bring it the most consistently. I don't think I've seen him mail in a performance yet. He knows what his audience wants, and I don't really think he deviates too far from it. Thanks for enjoying Van Damme month! We got some more fun Van Damme movies to post. He always delivers. Especially in Knock Off, Timecop and Sudden Death. Another cracking/bonkers film from Tsui. More films should have Rob Schneider being whipped by electric eels! Haha! That was a highlight of his career! Another Van Damme/Hark classic. The Pumma sneakers that fall apart in the race are truly legendary. I remember Hark at the time commenting that he was relieved being back in Hong Kong filming, since he thought making Double Team in Europe was a painful experience, with insurance fees, shooting permits, etc. The sneaker bit is pure genius! How did they think of that? Thanks for the Hark\Double Team info. Very interesting.